This is the start of my adventure into Substance Designer and onwards. I need to create a particular pattern for granite block work for a visualisation. I think I need to create two patterns and blend them together or maybe use the random tile generator but I am feeling very out of my depth. Any advice or references to tutorials will be very warmly accepted. I have attached some screen grabs from Autocad that I need to replicate. Here is a different solution. haha I feel quite embarrassed now........I have been battling away and surprised how simply you created that!! I have been trying to replicate the start of the tutorial where gradient ramps and a single shape are used to offer more flexibility further down the line, especially when creating degraded edges and weathering. Is this possible to recreate using the bond pattern I need. See my screen shot please. When I blend I am assuming the gradient is causing the fade issue? Maybe using Nicolas tile generator would allow the chance to do all the weathering at the start and then do the blend but that is super hard with horizontal tiles on the top of the blend? A good option would be to use the 'flood fill' node followed by a 'flood fill to gradient'. These nodes offer a lot of flexibility for these kind of brick patterns, but you don't see them in older tutorials because they are still somewhat new. Thank you Eggfruit!! I once again greatly appreciate the help and advice. I will look at that node and have a play. The gradient fills look exactly like what I was trying to achieve. 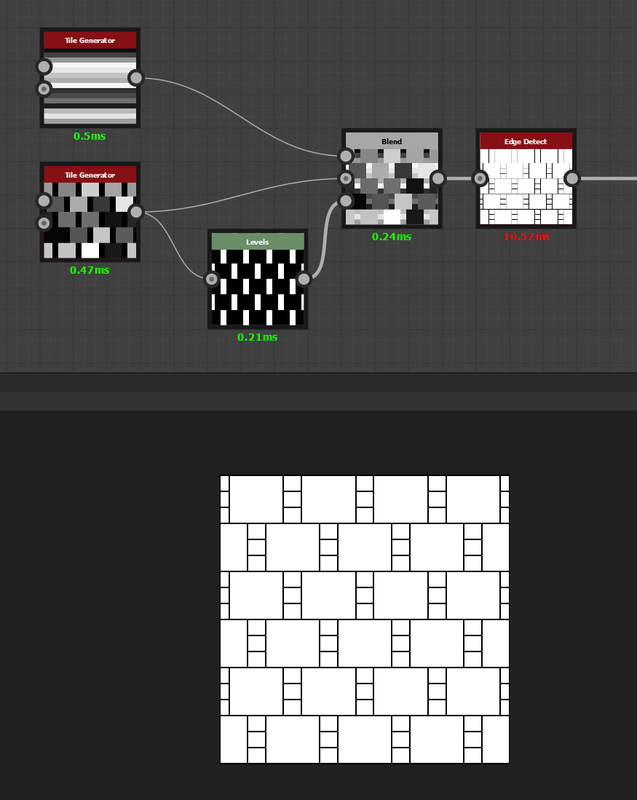 Sp many things to learn with substance designer. Its quite daunting being new to it all but clearly an incredibly powerful bit of kit. Yeah, SD definitely takes some getting used to. There are always a hundred ways to achieve something so it helps to just play around a lot with different nodes to get a general idea of what the possibilities are. Feel free to keep asking if you have any more questions or run into something. .........................Feel free to keep asking if you have any more questions or run into something. Thank you Eggfruit. You may come to regret that!! I am just finishing off the modelling stage. I am determined to use SD for the majority of my texturing....nothing like learning on the job to add some focus. I wanted to ask a question i.e what are types of brick bonding? Hey sonali31. Bonding is the pattern at which the brick or block work is set out in. You get lots of variations, the most common I believe is the stretcher bond where bricks lie over each others centers 50/50. This method is brilliant! I'm definitely gonna use this in the future. Thanks!